"The thread worked perfectly, besides coming in delicious colors, it doesn't fill the machine with lint. My students fought over this luscious plum color. I highly recommend this thread to anyone who wants hassle free machine quilting." Offering an attractive, organized and easy to shop store layout is more important now than ever before. 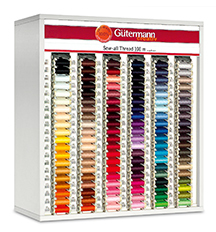 This streamlined, modular thread display system by Gütermann allows stores to have the selection and variety in high quality threads that makes sense for their space and customer projects. With units available in three varying sizes, there is certain to be a display to match your space. 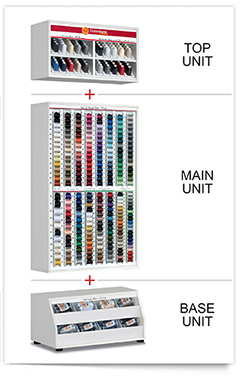 With a comprehensive selection of threads for a myriad of applications, the modular display system can be integrated into a variety of different combinations to best suit your needs and available space. The new Stationary counter display offers small stores a productive range of colors in a minimal amount of space. 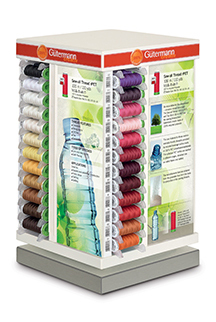 The Spinning Tower 48 contains a lovely assortment of environmentally friendly Sew-all rPET thread. 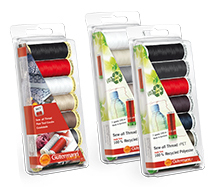 This recycled Polyester thread has all of the same premium quality attributes as Sew-all thread, but is eco-friendly. 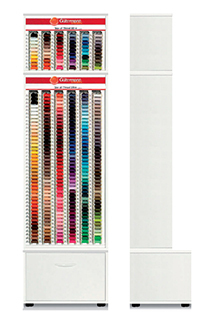 The Spinning Tower 80 provides a collection of either Sew-all, Cotton 50 or Trilobal Polyester threads. Attractive project photos adorn the sides to inspire application ideas and give detailed product information. The Sewing Room Thread Organizer is the perfect spinner for a home sewing room or designer studio. Attractive project photos adorn the sides to inspire application ideas and give detailed product information. 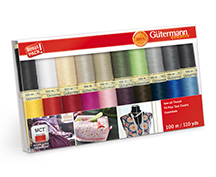 Perfect as a gift or a last minute purchase at the register - these thread sets contain 10 spools of beautiful Rayon 40 or Trilobal Polyester 40. Available in vibrant Spring and Fall color themes. 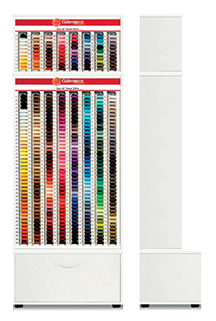 Excellent for both advanced and beginner machine embroidery. 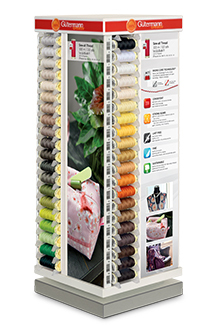 Perfect as a gift or a last minute purchase at the register - these thread sets contain 20 spools of beautiful Rayon 40 or Trilobal Polyester 40. 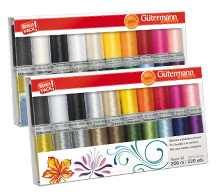 Excellent for both advanced and beginner machine embroidery. 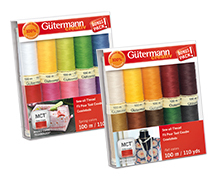 The perfect gift for the quilter in your life or as a last minute purchase for yourself at the register - this 8 spool cotton thread set with set of Fabric clips is sure to please. Excellent for both advanced and beginner quilters. 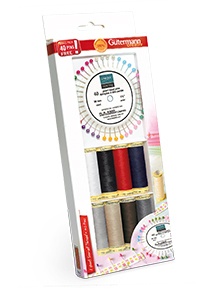 Perfect as a gift or a last minute purchase at the register - these thread sets contain 10 spools of lovely Cotton 50 thread. Available in beautiful Spring and Fall color themes. Excellent for both advanced and beginner quilters. 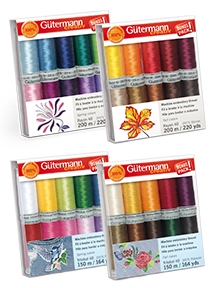 Perfect as a gift or a last minute purchase at the register - these thread sets contain 20 spools of beautiful Cotton 50 thread. Excellent for both advanced and beginner quilters. 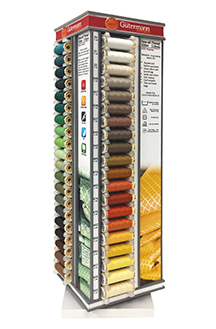 The perfect sewing thread set containing 8 spools of Sew-all thread in popular colors, plus 40 Pearl-headed pins! A great gift for both advanced and beginner sewers. 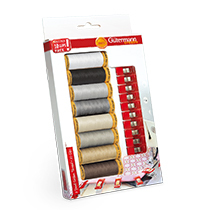 Whether bought as a gift or a last minute treat for yourself, these 7 spool sets of Sew-all thread bring high performance to sewing fans. 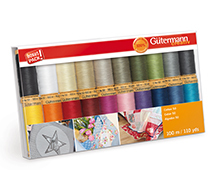 Perfect as a gift or a last minute purchase at the register - these thread sets contain 10 spools of premium Sew-all thread. Available in beautiful Spring and Fall color themes. Excellent for both advanced and beginner sewers. 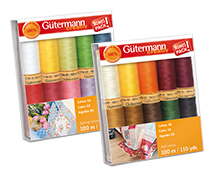 Perfect as a gift or a last minute purchase at the register - these thread sets contain 20 spools of lovely Sew-all thread. Excellent for both advanced and beginner sewers.